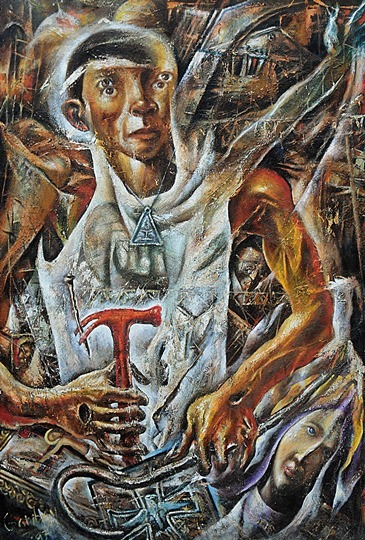 Emmanuel Garibay, ‘Bathala’, 1997. oil on canvas, 182.88 x 137.16cms. Collection of the artist. Striding out of the picture plane, this figure of Christ seems to rip through the surface of the work, hammer and crowbar in hand ready to disrupt the very order of things. No gentle saviour or calm man of peace who would be at home in the churches of the middle class, this figure concentrates his gaze on some point situated in the world of the viewer. He is striding with urgency towards an appointment with the future. Two sets of eyes, one fixed perhaps on the viewer, the other on this moment of decision and disruption. This Christ is the Liberator, disturber, prophet, and builder. He has in one hand a hammer to build; in the other a crowbar to pull apart. One can imagine that this tool could have even been useful in pulling out the nails in his hands. This is a figure of fierce passion and decisive action, an unstable, unpredictable force for renewal, the iconoclast, a breaker of images, with eyes on the emerging signs of justice and compassion. This is the work of Filipino artist Emmanuel Garibay, an artist who has received wide recognition in his native country for his challenging and moving realist images of Filipino society. He is a person of great warmth with a steely eye for injustice and pompous self-righteousness. In a country that is mainly Christian, he scrutinises the conventions and comfortable icons of his culture to shake out the new possibilities of hope and renewal. His works are often funny, ironic, and full of curiosity and compassion. They often represent the poor in dignified roles while upending those in power who are too familiar with their social prestige and the trappings of position. When he turns to religious imagery he is particularly sharp and incisive. This Christ is not a light-skinned person of European origin, which is the manner in which the Spanish depicted the figure during the 400 years of colonial rule. Nor does he fit the glossy expectations of TV evangelists and modern-day miracle workers that have arrived through American pop culture. This is an indigenous Christ, who arises within the culture as a force for hope and liberation. The European colonialisation of the Philippines stands out in contrast to most other countries in Asia. While the rest of the region has maintained distinctive indigenous cultures and religious expression, mainly through Buddhism, the Philippines has been subject to over 400 years of European colonisation. From the 1540s, the Spanish ruled this chain of over 700 islands, linked closely to trade and cultural links with their Latin-American colonies in Mexico and Cuba. This was followed in 1898 when the USA annexed the country as part of their colonial expansion. The country only found its independence in 1945 after the Second World War, and now boasts a population of over 100 million people. It is a country with a split personality, where the tourist brochures proclaim the citizens as the happiest people on earth, while its inhabitants continue to live under this colonial imagination, held captive by corruption and the forces of globalisation. Garibay, through his lively and expressive works, provides a sympathetic window into this complex yet wonderful country. He also gives insights into the complex problems of colonisation and the challenge of seeing things as they really are. Garibay’s search for an Asian or indigenous Christ figure is at the centre of his work. In that search, he draws attention to the nature of our situation where we are often blind to the truth of things because we are ‘cultured’, because we see things as natural and self-evident when in fact they are mediated to us by our context. Simply put – is the image of Christ a European one – fair-haired and blue-eyed, or even perhaps a Middle Eastern one – darker skin with a curly dark beard? Garibay peals off the skin that sticks to our eyes to realise how conditioned we have been to the figure of Christ who is at home within our culture and rendered as a safe citizen who obeys the laws. This familiar Christ is rather ineffective and finds no vocation as a prophet within our world. The work Bathala renders the Christ as a disruptor of culture. It is representative of Garibay’s tendency in all his work, to wake us up to our blindness, and to awaken a Christ set free from stereotypes, churchly piety, and good manners, that in turn may upend the order of the things towards a more just and humane world. Emmanuel Garibay is an important artist from the Philippines who has gained wide recognition in his own country for his social realist painting and drawings. His works have been exhibited in Australia, Europe, and North America. His work has also been widely reproduced through many publications around the world as they explore issues of justice and the search for Christ in Asia. In 2011, the Overseas Ministries Study Centre (OMSC) published a 72-page book Where God Is: The Paintings of Emmanuel Garibay, which provides a useful full-colour survey of his work. Next Post Theology and the Arts, at Whitley College. This is a powerful and provocative picture. Thanks for the insight and commentary Rod.